Elektra serves as a universal and secure framework to access configuration parameters in a global, hierarchical key database and provides a mature, consistent and easily comprehensible API. Its modularity effectively avoids code duplication across applications and tools regarding configuration tasks. Elektra abstracts from cross-platform-related issues and allows applications to be aware of other applications' configurations, leveraging easy application integration. See the readme for more introduction. See the glossary for the used terminology. On the one hand it gives an overview and an introduction for developers using Elektra, on the other hand it gives an informal description what methods must and may provide to allow an alternative implementation of the API. Important: On GitHub links to API functions are broken, so it is recommended that you continue reading in one of these links above. List of all available Plugins and get started by developing your own plugins Plugins. The API was written in pure C because Elektra was designed to be useful even for the most basic system programs. There are 5 trees (=namespaces) of keys: spec, proc, dir, user and system that are all unified (in the given order) in one cascading tree starting with /. The cascading tree is the logical tree to be used in applications. The other trees are the physical ones that stem from configuration sources. When using cascading key the best key will be searched at run-time, which appears like a tree on its own. 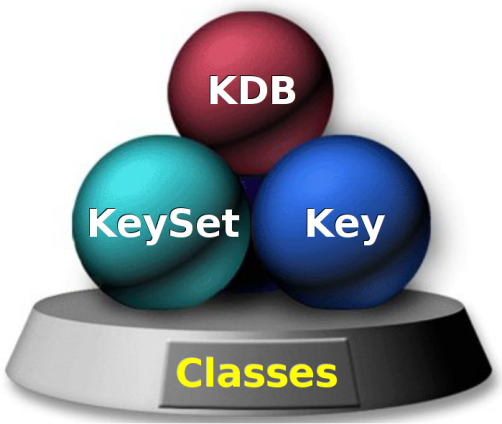 See cascading in the documentation of ksLookupByName() on how the selection of keys works. Is the only read-only tree. The configuration does not stem from the KDB (Key Database), but any other source, e.g. command-line arguments or environment. Allows us to have a per-directory overwrite of configuration files, e.g. for project specific settings. Used to store user-specific configurations, like the personal settings of a user to certain programs. The user subtree will always be favored if present (except for security concerns the user subtree may not be considered). It is provided to store system-wide configuration keys, that is, the last fallback for applications but the only resort for daemons and system services. Read more about namespaces and a tutorial for namespaces. You are not allowed to create keys right under the root. They are reserved for more generic purposes. org is the organization. For uniqueness a full reverse url encoded with '/' instead of '.' is useful. current is the default configuration profile. That means you just need to kdbGet() /sw/org/myapp/#0/profile and then ksLookupByName() in /sw/org/myapp/#0/profile/key where profile is from command-line arguments and defaults to current. The core of Elektra does not store configuration itself to the hard disk. Instead this work is delegated to backends. If you want to develop a backend, you should already have some experience with Elektra from the user point of view. You should be familiar with the data structures: Key and KeySet Then you can start reading about Backends that are composed out of Plugins. To get started with writing plugins, first read our plugin tutorial and then lookup details in the API description in Plugins.